It's Tuesday and time for another challenge from the Everybody Art Challenge Team. With the Easter break getting closer we would like to see your Easter projects. 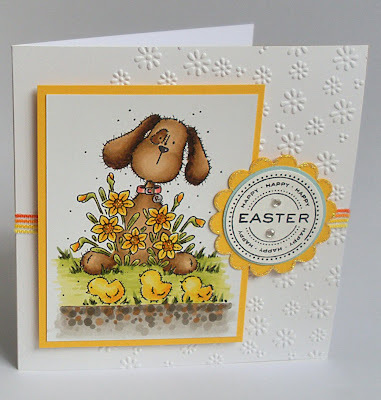 I don't usually make or send Easter cards because I don't know anyone that celebrates it in that way so have used a card that I made at a recent Copicific Retreat that I attended. The components and design of this card was not something that I came up with, that pleasure goes to a very talented lady called Karen Brown who was one of the demonstrators during the Copic weekend. I did however, colour the image, stick everything together, oh and added the ribbon! Such a cute little pup and easy to colour with Copics. The dry embossed background is by Crafts Too - Daisy, the sentiment is by Personal Impressions and the ribbon was purchased at the NEC recently. Die Karte ist ganz wundervoll. Das Motiv ist phantastisch coloriert und der geprägte Hintergrund mit den Blumen bringt es toll zur Geltung! Oh wow Jenny,this is too cute,Justlove it! Love the sweet image Jenny, gorgeous card. Love the white background and burst of color in the image, really focuses the eye on the adorable doggie! Lovely!